Insights and Rants: Check Your Browser! 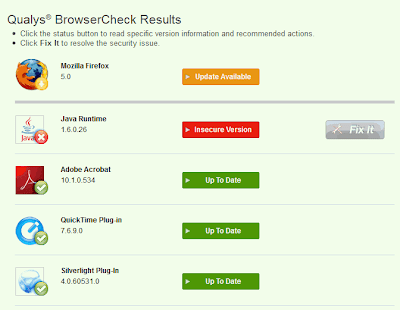 It's interesting that it reports the availability of version 5.0.1 even before the browser itself offers the upgrade. 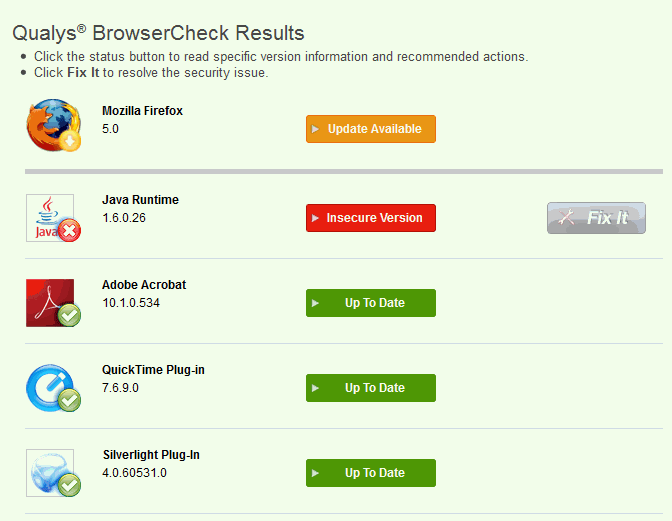 It also shows that (once again) Java is vulnerable, but no fix available yet. When you run this check on Google Chrome you may need to load the "about:plugins" page to be able to disable plugins like the RealPlayer plugin, which you may not be using. I also found its false warning about a "potential threat" in Adobe Flash a bit annoying: it doesn't check the version number correctly. Hopefully this will be fixed before another flash vulnerability comes along. The bug doesn't happen if the plugin is installed.